Do you have a menu engineering strategy? If not it might be time to take the plunge and learn how how to design your menu for greater profits. With the power of menu engineering you can gain ongoing profit increases of up to 20% from one menu redesign, and compound this with future refinements, and of course, additional profit increases. With potential impact this large menu engineering is an essential strategy that can be applied to not just regular restaurant menus but any situation where a menu is needed such as wine lists or menu boards. How to define menu engineering? Menu engineering is split into two main sections. Firstly it's the study of the profitability and popularity of menu items, and secondly how these factors influence the placement of item on the actual menu. In short it's the combination of number crunching and design. The goal is simple: to increase profitability per guest.The concept of menu engineering is not based on randomly testing what works on a menu. It's an accepted technique with over 40 years of history of being applied to businesses that make use of menus to sell their products. This makes menu engineering applicable to more than just the restaurant business. Simply put, if you sell items that have varying levels of profitability and popularity, menu engineering may help you increase your profits. A well-executed initial menu-engineering strategy can be complicated and time consuming - especially if you are just getting started. Once you understand the process and execute the strategy the impact is usually in the range of 15-20% for a newly engineered menu. As you refine the process over time this number will surely drop but expert menu engineers can continue to get a 10% bump in profits over time. Many restaurant owners are not aware of potential impact of menu engineering. Estimates suggest that around 40% of operators are using at least basic menu engineering. This means 60% of restaurants aren't grabbing the full potential from their menu. Across the industry this adds up to millions of dollars every year. The difference between the more and less successful attempts at menu engineering does not hinge on an establishment’s type or size. Instead, the determining factors are the restaurant owner/manager’s knowledge of the menu and willingness to put in the time and effort needed to understand the process and execute changes. There are 3 steps to the menu engineering process. Recipe costing is the process of breaking down every item on your menu to its individual ingredients and determining exactly how much it costs to create each menu item. This part of the process is fundamental to menu engineering and cannot be skipped. Restaurants must know how much it cost to produce each menu item as only then can't they work out profitability. Menu engineering is not possible without a fully costed menu. Unfortunately, most restaurants don't do menu costing and many who do, do it wrong. The right way to do menu costing means each menu item is costed in the same way using the same method so everything is consistent. For this reason the person who performs the menu costing is generally the best person to be put in charge of the menu-engineering process because they know the menu cost better than anyone else. Most restaurants don't cost their menu because it's extremely time consuming so they abandon the project. Putting in the time, energy and focus to properly cost your menu will have great benefits further down the line so it's worth taking the plunge and sticking with it. From experience we still think the best way to cost your recipes and menu is by maintaining a food cost Excel spreadsheet. For a complete guide to menu engineering including menu costing worksheets and other menu engineering Excel sheets download below. Need to know how to determine profitability and popularity of your menu using this worksheet? Category refers to the big pictures on a menu. Every menu is different but in a typical example these would include, Appetizers, Entrees, Desserts, and Drinks etc etc. Asian food menus might have completely different categories for example. Most importantly there should be no overlap between the menu items in the various categories and that the list makes sense for your particular menu. Next step is to further segment your categories into sections. Sections are different ways you can organize your menu according to the content. For example the Main Course category you might have vegetarian, meat and fish as sections. However you define your sections, be sure to keep distinct types of menu items separate from each other, eg. don’t include a collection of vegetarian and meat dishes in the same section. 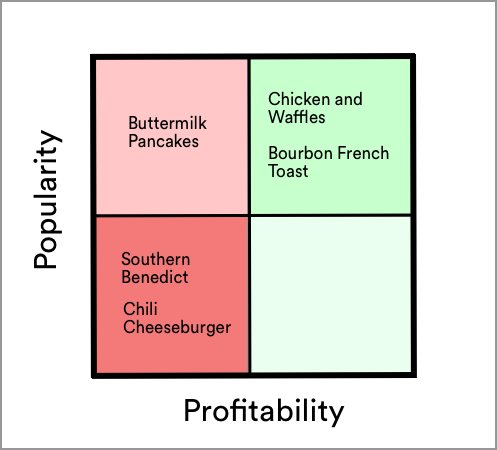 Go through each of your menu items and put them into one of the following four quadrants in your matrix. The menu engineering matrix is simply a 2x2 grid. Use the profit/popularity information to help determine how you want to deal with each of your menu items. You will need to look at the menu items ranked by profitability and popularity at the category level first and then at the section level. Viewing your data at the category level can help you decide where to place the various sections of your menu (for example, if pasta items are in your top right quadrant you want to promote them as much as possible. Viewing the data at the section level will then enable you to determine how to place and promote menu items within each section of your menu. Making decisions from the menu engineering matrix requires intuition and a deep understanding of your menu, brand and restaurant. These are basic strategies for each of the four quadrants. Top right: Promote these items as much as possible. Top left: Work out how to make these items more profitable. For example changing ingredients to lower cost. Bottom right: Understand why these dishes aren't more popular. Are your servers up selling them enough? Sometimes simply lowering prices will increase sales volume enough to produce higher overall profits. You could also considering starting again with these items. Dogs: These are obviously your worst performers and you should consider removing them. If you can't remove them they should be given the least priority on the menu and not promoted at all. The design process of course involves highlighting the items you want to sell the most but truly engineered menus go way beyond this one simple tactic. When designing your menu it pays to consider your customer base: what types of customers order which items, what makes them come to your restaurant? 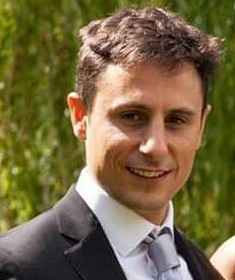 Menu design exists in the context of your restaurant, and knowing your customer demographics, behaviours and preferences helps you make decisions about certain menu design techniques. There are however certain best practices you should consider following to maximize profit from a menu. You can use various types of design strategies to highlight an item, such as putting a box around it, placing a photograph or drawing near it, or placing an asterisk or some form of visual cue next to it. For more on creating a successful menu design. Photographs: Using a photograph can increase sales of an item by as much as 30% when there is just one photograph on the page. Photographs on a menu also tend to cheapen the entire menu concept, so don’t use this technique at a high-end restaurant. Frequency: The more visual cues you have the less impactful each one becomes so avoid over using them. Lots of boxes can also make your menu look ugly. Space: Highlighting items often takes up additional menu space. This means the dimensions of your menu should be large enough to easily fit all your design elements. Placing your prices in a column causes customers to focus on price, not your food. This causes people to choose cheaper options. A better solution is to place the price directly after the menu description in the same font. It's usually best to avoid the using the $ sign or anything else that indicates money. Use item descriptions to your advantage by putting effort into the descriptions of items you want to promote. Use descriptions to set an item apart: Don’t just list the ingredients; use evocative text that will get a guest excited. Can you create a story behind the dish and it's ingredients? Mention brand names: Any ingredients that are brand names should be included in the description. List order is important. The first few spots in the list get attention thats correspond to their position in the list. Items further down the list get increasingly little attention. However the last item in the list gets a similar amount of attention as the first spots. Lists should be short. Between 5-7 items per list is about right. Smaller list are easier to understand and lead to more high value orders. More than 7 and the viewer can't parse the list very well. This causes people to order lower value items they can easily understand. Unfortunately, the most common menu items tend not to be the most profitable ones. Not all menu cover configurations (one panel, two panels, etc.) are created equal. They differ in the way customers react to them and in the extent to which they allow menu engineering to affect your profits. One-panel: People make decisions faster with these menus, but they won’t order as much, thus leading to lower profitability per customer. This shows a more casual emphasis. Two-panel menu: This is usually the best option and fits into the most use cases. It is easy to read and induces the strong feeling of a full dining experience. Three-panel menu: This is a valid choice if you have many items to sell and need the space, but the two-panel version is easier to read. Many-panel menu: The more panels you have in your menu cover the less control you have over the menu. Larger menus hinder your ability to influence customers’ actions. The design of your menu dictates how a persons eye moves. You can place chosen menu items in spots where they are likely to receive the most - or least—attention. It's important to try and strike a balance. If the dish you want to promote is very expensive, you may want to not put it in the best position as this may make your restaurant appear too expensive, when in fact it is reasonably priced. Beyond the menu itself you can also train your staff to suggest and effect what people look at on your menu. A well timed suggestion can be very effective in directing people to the best menu items for your restaurant. Go one step further and use the guest data from your reservation system to make personalized recommendations to your guests. Now it's time to test your new menu design. After your menu goes live it's important to track weekly revenue and cross reference with your weekly food costs. The process doesn't stop there. After you assess the success of your newly engineered menu, it's time to go through the process again and see where you can make even more gains. Our menu engineering guide helps you execute your menu strategy. It contains all the Excel worksheets you need to cost your recipes and find profitability and popularity.